The world’s leading PC manufacturer Lenovo acquired Motorola Mobility from Google for ~ USD 2.91 Billion. With this deal, Lenovo acquired the MOTOROLA brand and Motorola Mobility’s portfolio of smartphones such as Moto X, Moto G and the DROID™ Ultra series. 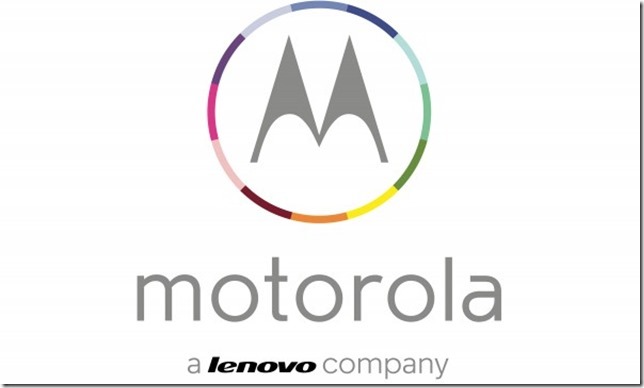 In addition to current products, Lenovo gets ownership of the future Motorola Mobility product road map. However, Google retained ownership of the vast majority of the Motorola Mobility patent portfolio, including current patent applications and invention disclosures. Learning from the past, Lenovo efficiently utilized the brand value of IBM ThinkPads after acquisition and maintained it well, hence we expect Lenovo to maximize advantages of this acquisition and boost its competitive edge on a global level. According to our quarterly Market Monitor service, Lenovo is the second largest smartphone vendor in the world’s biggest market, China. Lenovo is making strides to expand its presence outside of China entering into key emerging markets such as India, Russia and South East Asia. To become a global smartphone player, Americas market presence and growth is the key. Lenovo will look forward to leverage Motorola’s strong brand presence, mind-share and strong carrier relationships to succeed. Although Google retained Motorola Mobility’s key patent portfolio, including current patent applications and invention disclosures; still these companies together can offer handsets having innovative features and applications. In light of the deal, Lenovo has stepped up promotions for its flagship Vibe X not only ahead of Chinese New Year season but also is evident in newspapers and roadside billboards in markets such as India to gain maximum mind-share. Lenovo has been pretty aggressive with its pricing in its domestic market which is evident from the wholesale ASP for this Chinese vendor. Lenovo’s portfolio and hence sales are heavily skewed towards the high-growth sub-US$100 segment. 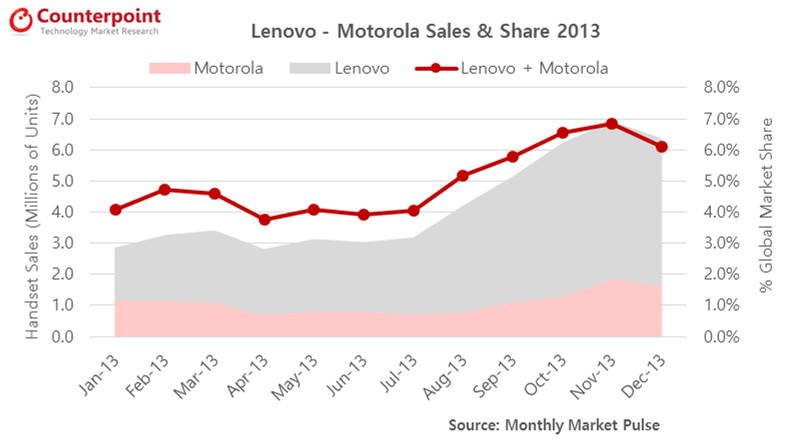 What Motorola deal could help Lenovo is to first create a strong mid-tier to high-tier smartphone portfolio. This would help Lenovo boost its ASP, top-line and bottom line. For comparison, Motorola has been commanding healthy ASPs for its portfolio thanks to premium portfolio across key US carriers and generous subsidies. But, lately Motorola with Moto X & G has looked to create “affordable premium” portfolio which could disrupt the market and chimes well with Lenovo’s low-cost strategy. 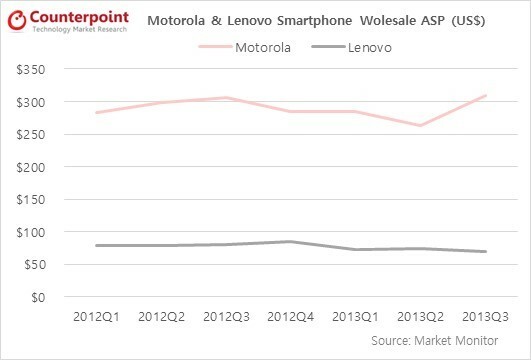 Following is a snapshot of Motorola & Lenovo’s wholesale ASP over the past several quarters, sourced from Counterpoint Research’s Market Monitor service. Along with Motorola’s brand, engineering expertise, strong presence in Americas, Lenovo inherits a company which is operationally challenged. Motorola over the last several quarters have generated steep losses. This will remain a challenge for Lenovo on how it not only becomes the third largest vendor by volume but also becomes a profitable global smartphone brand. Thus moving up the price-tiers in smartphone segment and gaining foothold in key subsidy driven markets will be the key to become profitable by generating enough scale and balancing overall costs. Furthermore, when such an acquisition occurs, human resources of the acquired company is impacted the most. There will be changes in terms of organizational structure, culture, company policies, etc. Moreover, employees at Motorola initially faced some challenges getting accustomed to Google’s culture over the last one year and now they will have to align to a Chinese company’s culture which might take a huge toll on these key resources. Brain drain effect and retaining key Motorola talent, as a result of acquisition, is going to also be one of the big challenges for Lenovo. Also, acquiring Motorola does not necessarily mean that Lenovo will get instant access to the US operators’ selves and subsidies budget. 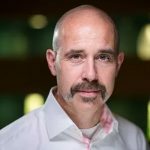 The company will need to prudently leverage Motorola’s existing strong relationships with American channel partners to first get foot-in-the-door and then prove its low-cost leadership for long-term success. We believe the company should retain the name ‘Motorola’ or even the brand name “Moto” to reap maximum benefits and launch new premium products with this brand especially in key Americas markets. Lenovo should follow the same co-branding strategy as they did by co-branding with “Thinkpad” brand and maintained the mind-share and market share in global enterprise PC market Furthermore, Lenovo should continue its “affordable premium” and “low-cost” aggressive strategy in key emerging markets to offer more value to the consumers and capture maximum market share and gain scale. The next logical step for Lenovo would be to invest in software and services as well as R&D (for cellular IP) to compete with bigger players such as Samsung, Apple and Nokia.